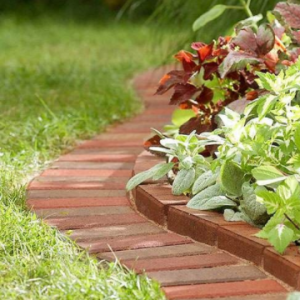 From natural plants to timber sleepers, we have a variety of awesome garden edging ideas! Your garden centre or hardware store will have a large range of garden edging ideas and materials. 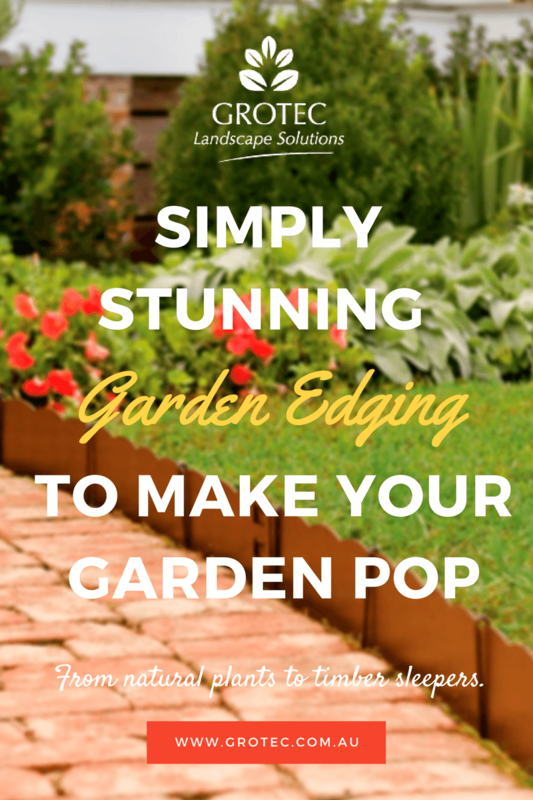 Decide which of these garden edging ideas suit you best, and Grotec can help. There is such a wide range of products that you may find it difficult to decide which form of garden edging you will add. The elements come in different materials, different colours, different heights. So, we can roughly divide these into ‘the seen’ and ‘the hidden’. For ‘the seen’ you need to decide what looks the best. For a brick house, an edging of bricks will enhance your planting. Similarly, for a timber house, there are a range of wooden products – sleepers, half rounds, bamboo, and many more. You may feel you want to carry the house colour into the garden, using a coloured product. There is a range of plastic and metal products that will enhance the garden. Similarly, if the garden is close to a concrete driveway, you could use concrete, or related products. Grotec can advise you. Don’t forget to create a mowing strip beside the garden edging, to save having to weed along it. For ‘the hidden’ there is a range of flexible, permanent steel, or aluminium edging that is put at the same height as the lawn, so that mowing is done over the edging, rather than next to it. This solves the problem of controlling the growth of grass at the edges. This is also a good option where the lawn is not growing evenly. Have you considered these natural garden edging ideas? In temperate areas Buxus, is traditionally used, but here Nandina, (heavenly bamboo) can also be utilised, and will provide interest throughout the year. There is also a wide range of Grevillea that suit the climate, and make a great garden edge, offering many different colours and growth rates. Why not try rock plants? Again, there are different colours and forms that can be grown as your garden edge. These hardy perennial plants are well worth the effort, and will give you mats of colours as your garden edging. You might prefer perennial succulents and cacti, depending on what else you have in the garden. Again, these will form low growing mats as an excellent garden edge. 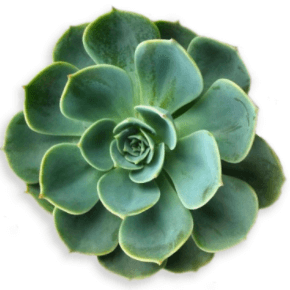 They are easily propagated from an existing plant, and can be trimmed to form the shape and size you want. Think about Kalanchoe as a garden edge, and choose all of one colour. Then there are perennial forms of Portulaca that are slow growing and partially prostate. 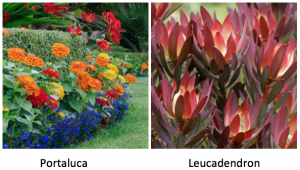 The idea is to mark out the edges, then behind them, give some height to the area by adding a higher growing eg Leucadendron, or even the slower growing Protea. It is then an easy job to mark the garden edge of your lawn using a sharp spade, or use an edge trimmer, perhaps twice a year, to keep the plants at the size you want.